Chameleons have always held a special place in the world of reptiles and continue to fascinate people everywhere due to their unique qualities. The Ambilobe Panther Chameleon is a native to Madagascar and comes in a variety of colours and can hide in various ways due to that special quality. 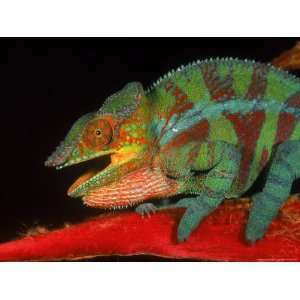 Belonging to the city of Ambilobe, Madagascar, the chameleon has been given that name and especially make good pets. Keeping in mind difficulties that are associated with their eggs, knowing how to keep these reptiles comfortable and easy is key to allowing them to properly breed and procreate. While the male may not give off such signs, the female Ambilobe Panther Chameleon will give you such indications that she is ready to breed. This normally happens once per month as she becomes an orange-beige colour, showing her willing to breed. It is extremely important to bring the male to the female. This will not only allow for quicker breeding, but also keep the female at ease and less stressed about the situation. Normally, they should be kept away from one another due to the stress that may occur, unless breeding is the need of the moment. Depending on how the couple reacts, it is not always a smooth process and may take anywhere from two to three days as they familiarize themselves with each other. After a successful attempt, the female’s colours will darken and stripes will be much more visible on her body. It is now that the male can be removed from the area where the female resides. Now that the breeding process is over, it is time to help the female in laying her eggs and ensuring that baby Ambilobe Panther Chameleons won’t have a problem in coming out safe and healthy. Take the bucket and fill it ¾ with potting soil. In a timeframe of 14-33 days, the gestation period will come into effect and after that, the eggs should be removed and incubated in a separate cage in order to keep the babies safe from the mother, who will eat them once they hatch. 68 to 74 F is an ideal temperature range for the eggs, which may be up to 35 in quantity at one time. It normally takes eight or nine months for them to hatch and once they do, and walking around is a sign that the babies are healthy. They should be placed in a separate cage with three to four occupying one at once.